We are holding a PopinDropin on the last Friday of the month between 11am and 2pm for people thinking of joining the group. It is a chance for people to have a chat about the group and what it does to see if taking a more active part is for them. We meet at SCILL at the moment, but please check the Monthly Programme page for the latest calendar. We were surprised and saddened to receive the news that SCILL will be closing at the end of March 2017. This is the Closure Statement issued by SCILL. We have been very happy at SCILL and the staff have been hugely helpful to our group as a whole, and to individual members who have needed information. Obviously this news will affect us significantly and over the coming months we will be looking for alternative accommodation. We have put together a programme of activities up to the end of March and introduced the Manor Park Cafe as a meeting point, and depending on how we get on looking elsewhere, this may form part of our programme in the longer term. We are in touch with our local MP, Tom Brake, who is assisting us in finding alternative venues. We will keep you up to date on any developments and refresh our Calendar as appropriate. You can download the programme from our Monthly Programmes page. 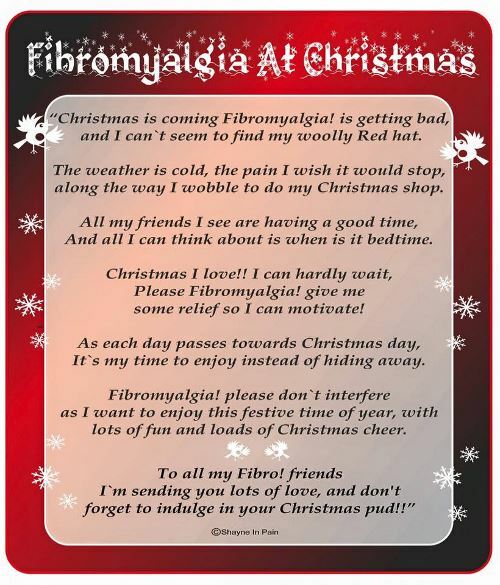 This is a link to a fibromyalgia blog which you might find of interest. Something worth reading. Click on the link.